Very well exposed, Steven, and you have caught the atmosphere. This. is part of what makes very big cities so livable when there are people ready to feed us even at ungodly hours! I would like to say that the atmosphere which is part of the picture is really focused properly. Good Exposure. How you managed to do this? May I say, how right you are about the atmosphere. This is generated by the darkness surrounding the lit stand in a New York night! The steam of the cooking obfuscates the venders face and shows activity. 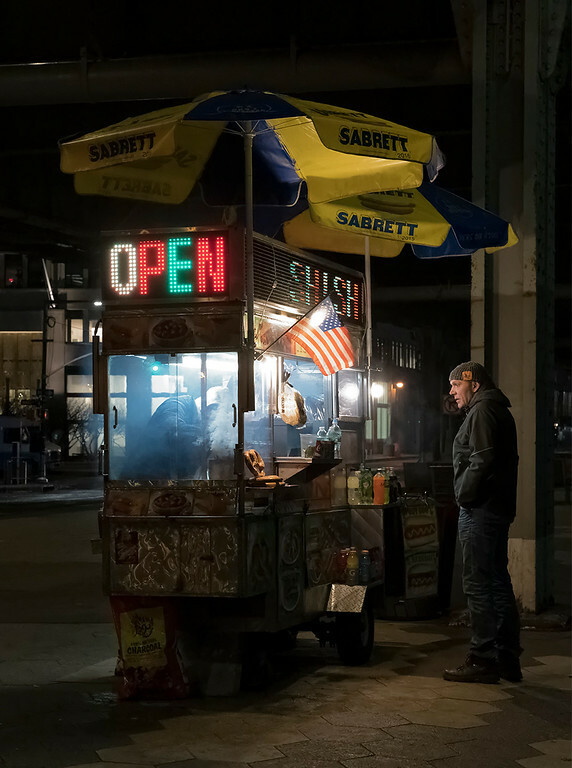 The light from the cart illuminates the face of the person getting his snack! A camera crew for a movie couldn't do better. What is required here is years of practice, deciding what is a treasure not to be missed and then discovering the angles from which this shot must be taken. Which country flies it's flag so much? Who eats at such places? Is SHISH THE FOOD? Is that like a kebab? What identifying feature says this is NY? That's paving on the foot path? Is this a quiet neighborhood? I fear the worst for the buyer. Botulinum has found a home. Yes,, folk like the flag. It represents the constitution and loyalty tonit, just like a crucifix is valued by Christians. Likely as not this fellow is an Arab and recognizably non-European. The flag is used here to tell the folks, I am one of the really good guys in your diverse city. It's New York because Steven wrote, "Manhattan", which is a huge Island and major part of New York City. The stand is regularly checked for strict hygiene by the City. It's safe as eating at a major restaurant or your wife's cooking! The questions were rhetorical. I was merely illustrating what passes as thoughts when I viewed the image. As for Christine's cooking, there is a warning: seek medical assistance if consumed. She does not yet know how to turn on the stove and has the credentials to burn water. I cook everything. Another nice shot from a night scene ! thank you all. it was a shot that just worked for me. In what way did it work, Steven? originally being a born New Yorker I have had many a meal off of these carts from the '60s onward. the atmosphere, which you really have no knowledge of, just clicked. I used to do work down in this particular area when I was young. I've done work in Sydney, Brisbane and Beerwah. one persons plague is anothers palatable moment. hey, I love White Castle. and I do survive. I can guarantee the individual working that cart did not originate in the US. but I can also say he feels better off where he is now. it works on many levels. time, season, lighting, aroma, the entire scene ties together. but probable not from someone who hasn't spent the time there.